When you or your loved ones' 40th birthday rolls around, sometimes it's easy to think of it as a bad thing. You may think you don't have the job you always dreamed of or the family you wanted. Yet, it's important to look at the positives: You made it! Despite four decades worth of trials and tribulations, you made it — battered and bruised, but you made it. Thus, it is critical to celebrate your victory by throwing a huge birthday bash. Which 40th Birthday Party Theme Should You Choose? However, don't think that any small soiree will do. This momentous occasion requires careful planning from start to finish. Make it a memorable get together by introducing a fun theme to get you and your guests in the partying mood. Before we get started, it's important to sit down and brainstorm. This process involves taking several things into consideration including your budget. If your budget is relatively large, consider purchasing most of your food, drinks, and decor ready-made. However, if money is tight, your best bet is to make the majority of your decorations and items from supplies purchased online. That not only saves you the time of going to every retail or wholesale outlet, it means you can make it look like you spent a lot more than you did. Making the majority of your decor items may be a bit of a challenge. Depending on your creativity and craftiness, though you could employ the help of friends and family. 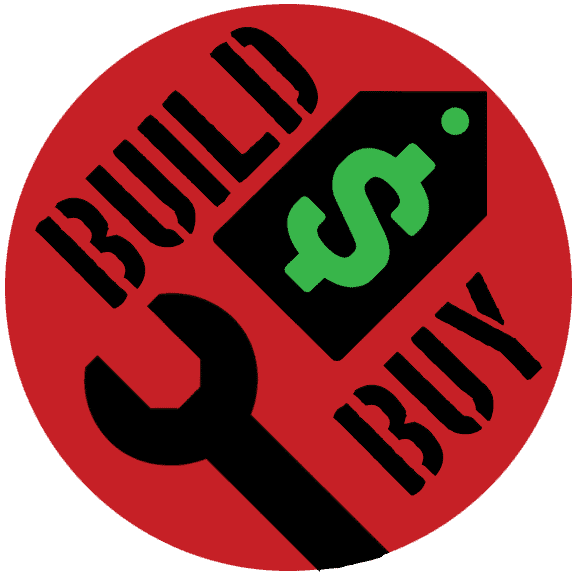 You'll need to pay for the majority of the materials, but the overall cost should be lower since you're making them. You could also DIY the menu from appetizers to desserts and everything in between. That should save you a significant amount of cash, which you can put towards purchasing a gift. However, remember, if your crafting skills aren't great, or time to do them right isn't available, you are going to want to spend the money. This milestone doesn't come around twice, so you want to do it right. Once you've decided whether or not you'll be making or buying the majority of your items, there are a few other things to consider. Here are a few other vital details you should plan before setting your plan in motion. First and foremost, you should select a party theme. Celebrating a 40th birthday shouldn't be as casual as other birthday parties. They are special celebrations that only come once in a person's lifetime! Therefore, plan to make the night go off with a bang by coming up with a party theme that aligns with their personality. Finding an appropriate theme depends significantly on the birthday girl or boy. The size of the venue and complexity of the menu should cater to the birthday person's likes. While guest preferences should also be considered, make that day all about the birthday person. If they are shy and demure, perhaps an intimate soiree surrounded by their closest loved ones with low-key decorations is the best choice. Contrarily, a huge bash with loud music and lots of flowing drinks may be their party scene of choice. Most of all, be thoughtful of their personality traits and mindful of their desires! 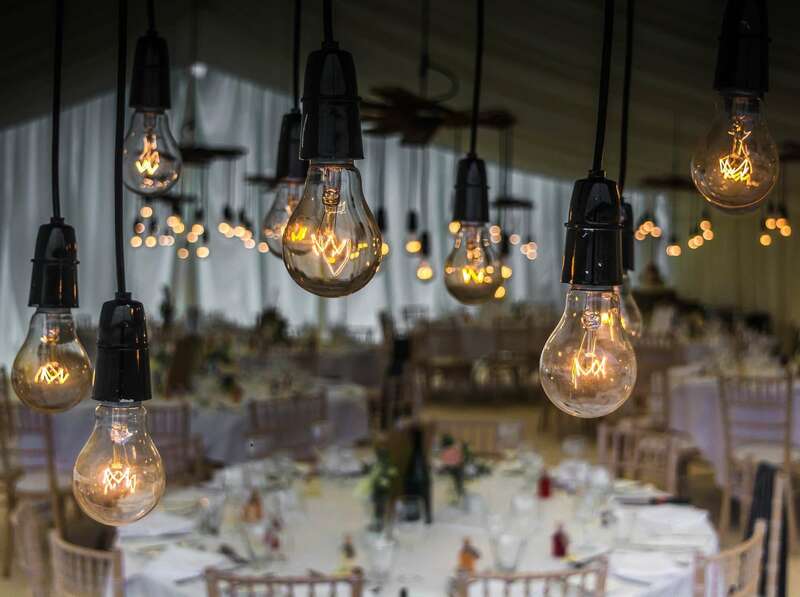 There are a few things to consider before booking a venue. Always refer firstly to your budget, as this determines whether or not the party should be large or small. Your party's size is also the determining factor for your party's location. 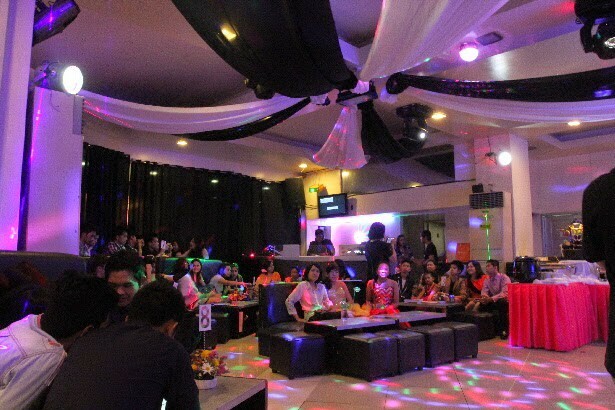 Small restaurants and party rooms have enough space for a dozen or even two dozen people. Larger venues such as a hall -- or, weather permitting, a courtyard -- do better to accommodate larger crowds. Plus, a larger place equals more space for things such as a dessert table, DJ booth, and even a dance floor. However, a local club or bar would better suit the birthday person's personality if they love loud music and crave a high-energy environment. Food is arguably the most essential part of any party. Depending on your taste buds, it may also be the most expensive! Most house parties have bowls containing anything from chips to pretzels and even popcorn. But when it comes to a 40th birthday celebration, you should aim for a little bit more class. Invest some time researching recipes for main courses you'd love to make. Or ask your group of friends for a caterer recommendation that works within your budget. The point is you should spend some time pondering your food choices because they could either make or break your party. Not unlike your food menu, the drink menu is also relevant. That doesn't mean breaking the bank to get your guests all happy drunk. Your drink menu doesn't have to include alcohol at all if you don't want it to! 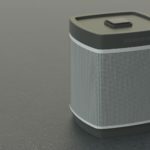 All it needs to do is refresh you and your guests when the time calls. That doesn't mean it needs to be boring (we certainly don't recommend forcing everyone to drink water). Your drink should be a combination of delicious and perhaps even thought-provoking. Imagine sipping James Bond's favorite drink (shaken, not stirred) while waiters serve canapes around round tables of groups of men and women playing cards. On the other hand, pouring yourself a drink from a jug labeled "Sunoco race fuel" while chatting with other guests in NASCAR attire is equally amusing. It's all about keeping up with the theme, so the atmosphere and illusion of stepping foot into another world remain undisturbed. Once the theme, venue, and menu (both food and drinks) are taken care of, it's time for decorations. You could have the best place imaginable, but if the decor doesn't stack up, it'll fall flat. If you've decided to do most of them yourself, get out your calendar and plan your days. Give yourself enough time for each section to complete your projects on time. If you're buying your decorations, check more than just one store. Shop around for options to fit the mental picture of what you want your party to look like. Most importantly, plan for mistakes and delays. All too often we're held hostage by ordering the wrong item online or praying your item ships in time for the party. Planning for bumps along the way makes sure there are no surprises. Now, for the moment we’ve all been waiting for: exploring our themes! 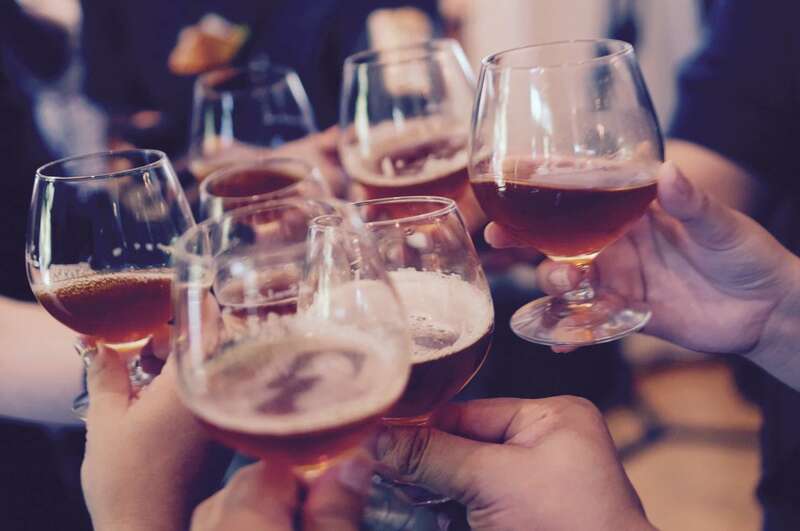 We searched the web and found the best menus, venues, and themes to make your 40th birthday celebration a huge success. Does your significant other dream of weekend fishing trips to the lake? Do they search up recipes for their fresh catch only to end up BBQing it every single time? If this sounds like them, they are going to love a 40th birthday celebration about this peaceful pastime. However, planning a fishing-themed birthday bash is far from quiet. You’ll also want to try and steer clear of the childish version of this theme. And that means no golden fish snacks and no gummy worms! 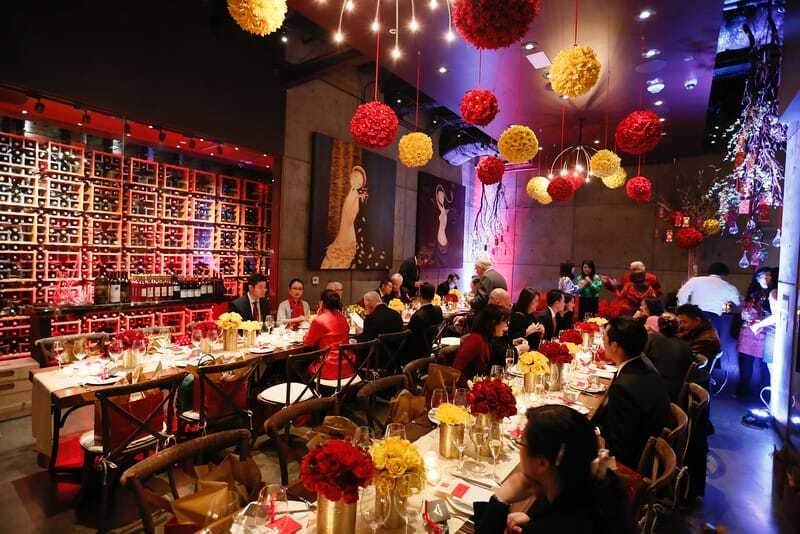 Your venue depends significantly on the size of your party. If the weather cooperates, an outdoor space such as a park or picnic area near a lake will make the perfect party spot. Decorate the place with tasteful fishing décors such as paper lanterns painted half red to resemble fishing bobbers and fishing nets along the walls. Most fishing coolers are jam-packed with beer, so the party should be no different. Fill a small canoe or boat with ice and beer so your guests can help themselves at this self-serve bar. Use tackle boxes, buckets, and wicker baskets to hold everything from napkins to baguettes. Instead of catering or pre-making the main course, pack some wings, ribs, and fish, and barbecue for your loved ones. Then sit back, relax, and enjoy the company and fresh air! 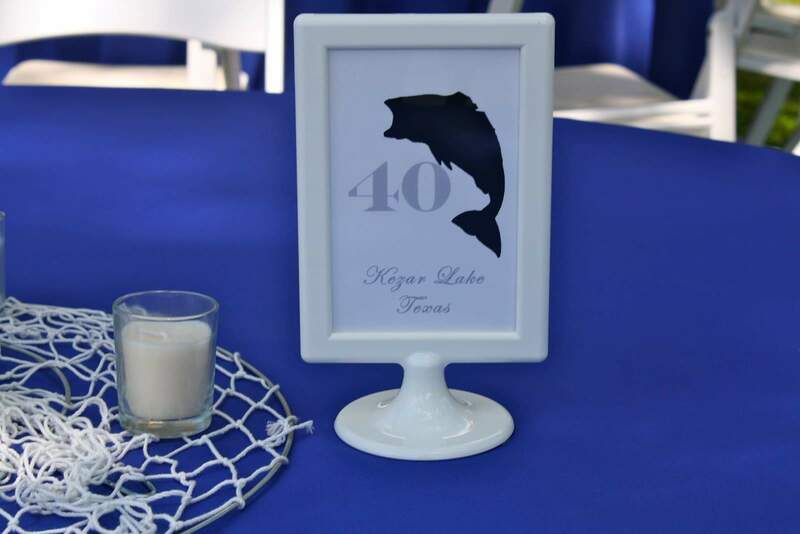 This 40th birthday party theme requires a larger budget. If you really want to go all out with a large group, research your venue options weeks in advance. Look for a space large enough to accommodate your guests as well as a few larger décor items (i.e., poker tables). Speaking of décor, this theme calls for plenty of chic pieces to make your space look top-notch. If the venue consumed most of your budget, you could always make some pieces such as unique wooden dice or garlands featuring card suites. 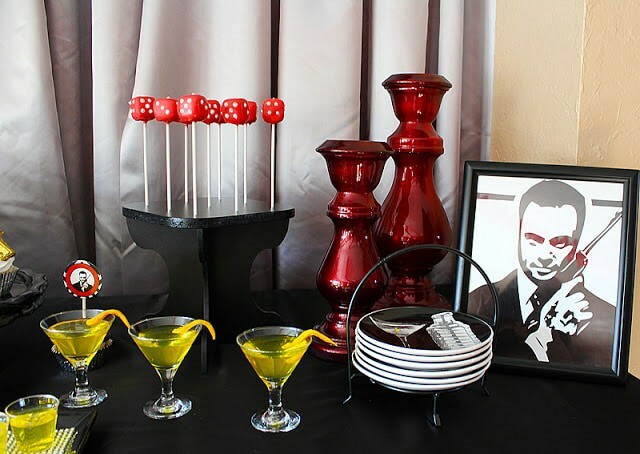 Make your party stand out by buying Vegas-inspired shot glasses and spread out some blackjack tables to keep the party going. If the invite list is long, your best bet may be to get the party catered by a local catering company. 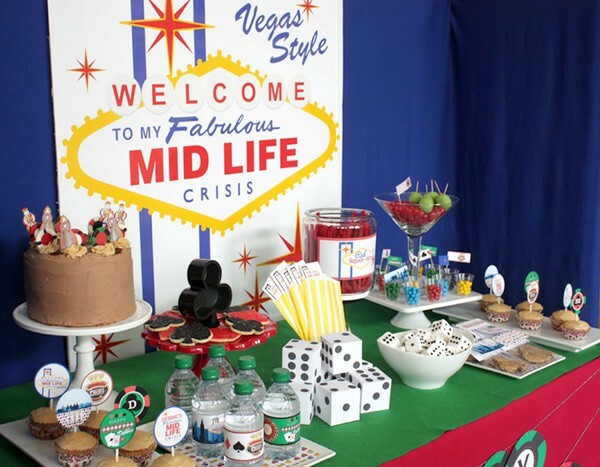 Cut costs by making your own desserts such as a tiered Vegas-inspired birthday cake or cupcakes. Additionally, your venue could offer an open bar for an additional charge. Otherwise, hire your own bartender and tell them to make a short list of two to four drink mixes such as Mai Tais, Manhattans, Pina Coladas, and Bloody Marys. 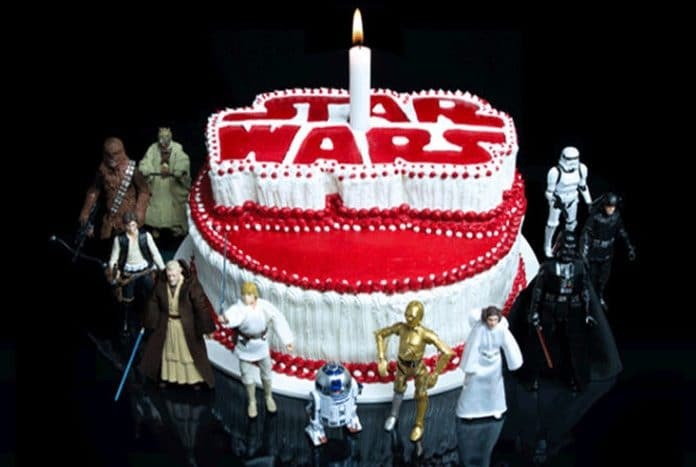 All your Star Wars fantasies come to life with this intergalactic 40th birthday party theme. While you could try and make this theme sophisticated and high-class, it would be much more entertaining if you nerd out! In this case, a medium-sized venue such as a basement or even your own home would do just great. Smaller settings make a party feel more intimate, and with such a personal theme, a private party will hit that much closer to home. Visit your local party store or look through Amazon for loads of decoration ideas. 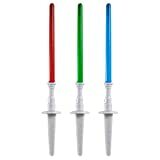 They can be as small as mini lightsaber cupcake topper or as big as a universe backdrop for photo opportunities. These creative picks are great for cupcakes, cakes and also make great party favors! The food and drink menu is where the fun starts. Since this is a casual, laid-back party, getting away with some Star Wars or space-themed puns is super easy. Pretzel sticks dipped in red or green candy melts become lightsabers, while seven-layer dip becomes “7 Leia dip." Turn on the grill and make some “Hans” burgers while your guests munch on lightsaber celery and carrot sticks. Make some Wookie cookies for dessert or challenge yourself by making a giant Death Star cake. Inspiration for Star Wars-related drinks is just as easy. Relabel jugs of limeade with “Yoda Soda” or “Jabba Juice” stickers. Or get a friend to create unique drinks in the kitchen which serve to refresh and entertain your guests. 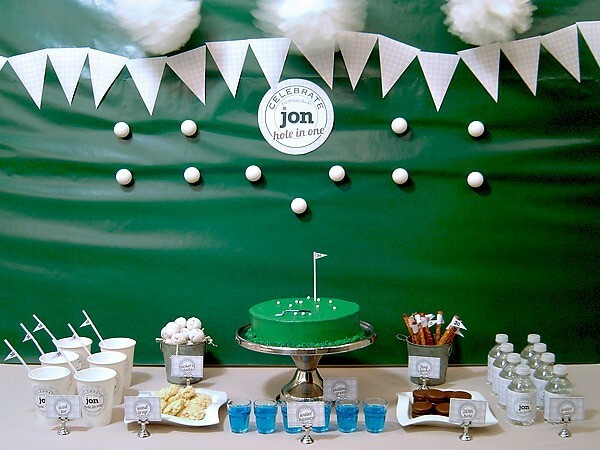 The avid golfer would no doubt love a 40th birthday party centered around one of their favorite hobbies. 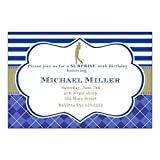 Invite your guests to the party with sophisticated invitations and send them out a few weeks in advance. If weather permits, the best venue would no doubt be at a golf course or range (indoors or out). When it comes to decorating, try to steer clear of kitschy, child-like decorations. However, don’t take all the fun out of a 40th birthday party revolving around this golf theme. Using banners or bunting flags with the birthday person’s name is an elegant way to make a statement. Invite your friends to a game of golf or indoor games (such as guessing how many tees are in a container) to pass the time. The food and drink menu should also be just as elegant as the rest of the soiree. Depending on your parties’ palette, order the main course from a restaurant of your choice. Snacks, appetizers, and desserts could be a little bit more fun. Re-label hummus dip as “sand traps” and potato salad as “putt-ato salad." Get equally crafty when considering dessert options by using lots of green frosting on cupcakes and buying golf-inspired cookies. Serve your drinks in pretty jugs with cute cue cards labeling them accordingly. Some ideas for labels are "sweet tee," "watering hole," and "putting green punch." If it is an all-adults party, amuse your guests with some fancy cocktails such as a pitcher of Tee Time or a fancy birdie cocktail. Just because you were born in the wrong era doesn’t mean you can’t celebrate it! 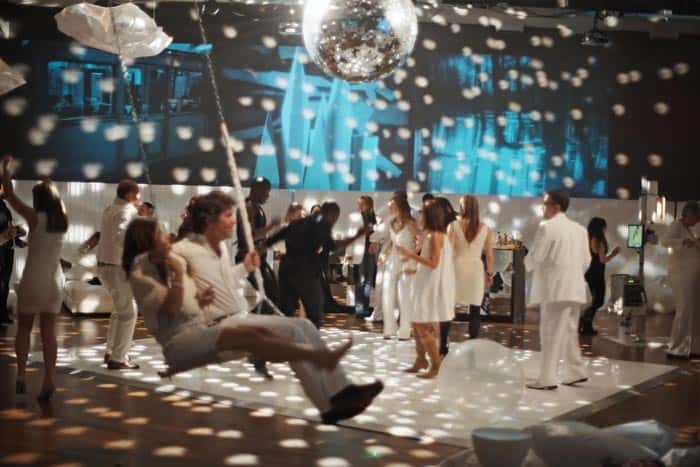 A disco-themed 40th birthday party brings all the fun and colorful decor to the forefront. Throw away your inhibitions and bring out the glitz and glamour: This theme is all about fun. Send funky invitations and invite your guests to dress up in their favorite 70s up to 90s getups. The venue could either be as large as a hall or as small as your very own home. The size is up to you. For some extra fun, rent an entire roller rink and decorate the place as you see fit. There were some interesting food options in the 1980s, some of which we are not opposed to eating! If you’re on a creative mission, make your entire menu inspired by the funky food of the disco era. If it’s a house party, make it more interesting by challenging your loved ones to make a 1980s dish of their own for a birthday potluck. 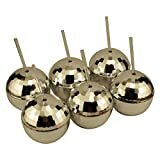 Invest in some fun disco ball cups and straws and fill it up with your favorite punch. Or, open a bottle of sparkling wine in tall glass flutes with a sprig of rosemary for a chic alternative. The James Bond theme is arguably one of the poshest birthday party themes on our list. Sleek, calm, and always relaxed, this theme is all about adventure, discovery, and the prospect of reward. Your venue depends mostly on the size of your party. However, this party theme wouldn’t look out of place in your own home or a restaurant. Décor-wise, aim for white and black with hints of gold and red. It's easy to find plenty of these colors and some retailers may even carry a section filled with goodies inspired by spy movies. Invest in high-quality balloons such as large gold numbers (either with the number 40 or 007). You could also purchase a mix of white, black, and gold balloons stamped with a symbol or pattern. 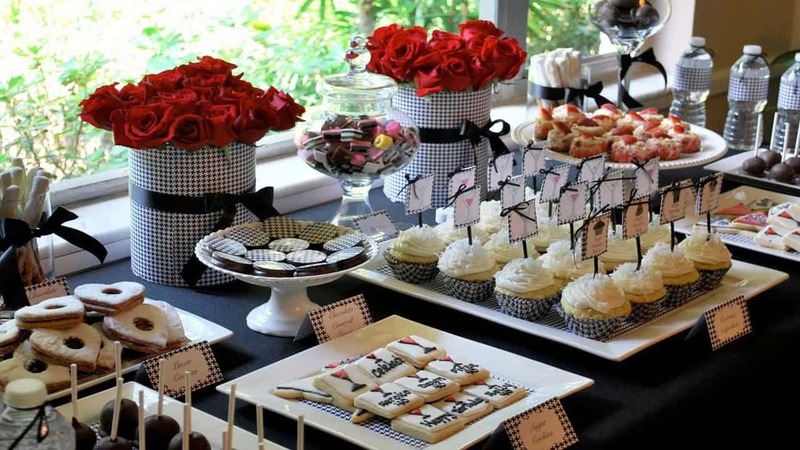 Take a load off and enjoy the party by arranging a catering company to come to your home on the day of the party. Or speak with the restaurant owner and arrange a price per plate, so everyone’s meal is to their liking. The real hero of a James Bond-inspired 40th birthday party is the drinks. While the classic martini (shaken, not stirred) is an obvious choice, old fashions, scotch and sodas, and vodka tonics are good options too. 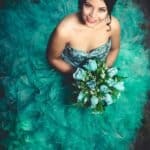 Choosing which 40th birthday party theme you should plan is ultimately dependent on the birthday person. If they dislike large, exuberant celebrations, choose a low-key theme and a small venue to ease the pressure of being the center of attention. However, extroverted individuals with an outgoing personality would surely love the complete opposite. In this case, large, exhilarating parties surrounded by their loved ones with loud music and lots of menu options should be your go-to.